I love snow, I think that is because having spent my entire 52 years in North Texas snow has always been a rare occurrence, so when it does snow it seems like a little miracle creating a landscape covered in cold fairy dust. I can probably count on two hands the times we've had enough snow to make a true snowman, top hat, scarf and all! My holiday decorations include an entire room of snowmen and snow decor, my own little snow fairy land. 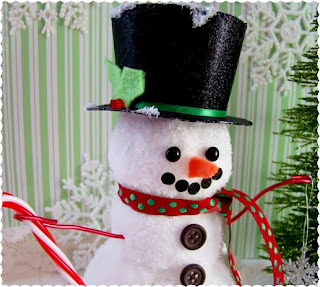 And during another covert trip to the Dollar Tree I found the supplies to create this cute little Frosty the Snowman! Take three of the Styrofoam balls, cut the bottom on the largest flat on one side, the middle ball cute flat on 2 sides, attach the 3 balls with a glue gun. Once the stack is dry un roll your cotton balls (the cheap cotton balls are best for this) and glue over the Styrofoam stack with a glue gun. Make a mixture of 2 parts white glue & 1 part water paint this mixture over the cotton ball covered stack, now snow glitter away! I let this dry an entire day and then sprayed with a clear coat to make sure that most of the glitter stayed on the snowman. While that was drying I started working on the top hat. I cheated a little on this and used a small Styrofoam coffee cup as my base for the top hat. Remove the bottom of the cup and then cut the height of the cup down. Using the black glitter paper cover the cup, see above, then cut out the rim and top of the hat. Simply assemble this with glue. I found that for this the glue gun did not work well, I would suggest another strong fast drying glue. Once the hat was dry, trim with ribbon, and little holly leaves from felt and red beads for berries and snow glitter. Once the snowman body is dry attach to the plastic white snowflake ornament,add the ribbon scarf, buttons and the wire arms. The face was created with 2 Victorian shoe buttons, hole punches from the black glitter paper and a cone of orange felt. I think he turned out pretty darn cute! He is pretty darn cute, I'm gonna have to make these myself. I never knew you could unroll cotton balls? Gosh where have I been. Thanks for showing us how to make. Thanks for sharing over at Sunday's Best. It's always great to see what you've been up to. Oh, they are sooo cute, I absoltely love them! I'm a new follower, please drop by when you have a chance. TOOO STINKIN CUTE!!!! I am your newest follower!!! Hope you will come take a look at my CHAOS!!! Oh my goodness, I cannot even tell you how much I LOVE this cute little snowman!? I'm adding it to my winter pinterest board. It gives me warm fuzzies!!! Your snowman is so cute! I grew up in Southeast Texas, so I know what you mean about not enough snow to make a snowman. He is such a cutie! I can't believe the supplies you used... I would have never guessed the cup! Thanks for sharing with us! Wonderfully adorable! Love the way you did the hat. Very creative. Oh yeah! I just pinned this too! Too cute! My little girl would find this guy mesmerizing. He's so cute!! Thanks for sharing! !